Offers opportunities for interaction and discussion. Features larger pieces that are easier to manipulate and enable the user to successfully complete a project while developing visual-perceptual skills and eye-hand coordination. All of the images are perceptually distinct and easy to identify, allowing a greater level of success by the user. Real life subject matter also offers wonderful opportunities for interaction and discussion. Each puzzle consists of heavy cardboard pieces and measures 12” x 17” when completed. Includes a reference picture for each puzzle. Designs include: Chairs, Kitten, Barn, and Flower. Set of 4. Pictures are nice material is not sturdy. I was disappointed in the quality of the puzzles as the description states that they are made of study cardboard. The pieces curl and pull apart easily from each other making it hard to keep the whole puzzle together while it is being worked on. Even though it is only 28 pieces this can be a challenge for an elderly person trying to fit pieces in and accidently bumping surrounding pieces etc.. The pieces are a nice size and the pictures are colorful but I would not purchase a second set. This product cannot withstand use. After completing the puzzle once the sides started to peel and it became hard to stick the pieces together. Material is cheap and not great for a puzzle. These puzzles are not only great but the are a real bargain too! Each one comes with it's own printed image to use for a guide and a plastic storage bag so they don't take up a lot of storage space!. Perfect for our memory care group! These are pretty nice but they came together in a pack with bags to store the puzzle. I don't care for that. 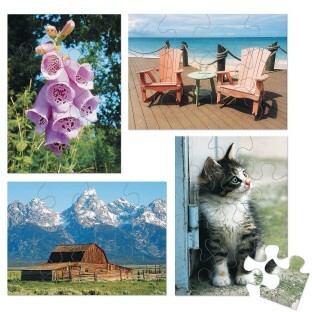 It also has a image that is the same size as the puzzle. I had to fold it to go into the back it came in. Wished it came with boxes for the puzzle.